"Stackable Initial Rings, Grandmother's Rings in Silver"
These simple silver stack rings are great alone or you can stack 'em up! The stackable initial rings look great when paired with our stackable Birthstone Dot rings! Stackable initial rings are great to mix and match! Stack and spell! 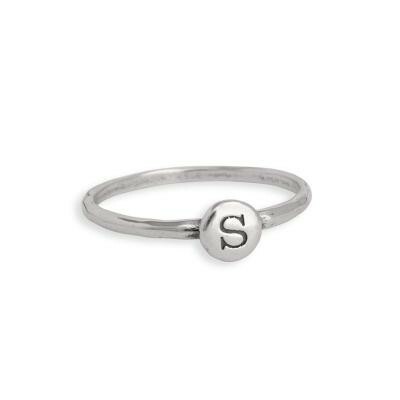 Say whatever you want with these great stackable Initial Dot Rings. Spell a grandchild's name, stack your initials or get one initial for each of your children/grandchildren. These go great with our stackable Birthstone Dot Rings. Most women can wear 4 to 5 stacked comfortably on their finger. Women with long fingers can usually wear up to 7. If stacking more than 4 rings, please see the sizing information below! Dimensions: each hammered band is 1/16" thick and each alphadot is 1/4" round.